Food and wine pairing classes this holiday season can be found at Agua Dulce Vineyards November 15, 22 and 29 from 11:30 – 1:00. Members and non-members welcome. Call for reservations and ask them all about their new Napa winemaker: 661-268-7402. The 6th Annual Halloween Party on Friday, 10/31 at the Valencia Wine Company will include prizes for Best Costumes, and your favorite musicians, The Helen LaPrairie Band performing classic rock and roll all night! Valencia Wine Company’s Annual Tasting Event at TPC on Saturday, November 15th is the wine affair of the season. Hundreds of wines will be featured from French Burgundy, Argentine Malbec to New Zealand Sauvignon Blancs. Along with the comprehensive tasting, the musical genius of Gerry Rothschild and Lynn Woolever will be providing vocal and instrumental jazz and pop for the guests. Entrance to this event also allows the opportunity to order wines at a substantial holiday discount – 15% off 6 bottles and 20% off twelve bottles. Tickets: $70 Call: 661.254.9300 to reserve your space. Also appearing at the Valencia Wine Company is the Awesome Helen LaPrairie Band on 11/21, playing your favorite classic rock tunes. Salt Creek Grille has weekly wine specials: Monday’s offer all wines priced under $100 are half price, “wine down Wednesdays” have all wines by the glass discounted and happy hour Monday through Thursday from 4:00 – 6:30 pm, and all house wines by the glass are $4. John R. Kelley, of Raven Oaks Vineyard’s, poured 2001 Cabernet Franc and 2001 Syrah in the cool interior of Bella Sport. Both varietals were grown in the Sierra Foothills of Northern California. Vino 100 owner Lil Lepore, alongside John, served the aptly named Hope Chardonnay and Shiraz. Hope wines give 50% of their sales, twice a year, back to charitable causes, and Lil contributes as well. We enjoyed all of the wines while Peter “the Goose” Goosens strolled over and helped fill in. Lee’s Wine Bistro patrons were handed stemless wine glasses for their choice of three from the four varietals offered: a unique Wolfgang Gru-Vee Gruner Veltliner white wine from Austria, St. Francis Chardonnay, Kenwood Pinot Noir and Kenwood Meritage. The Gruner Veltliner being the perfectly crisp apple I needed in the heat of the day, followed by the pleasant bouquet of the Meritage. Loose Goose wines sparkled beside the elegant jewels of Ro, Ma in the Goose’s large logo goblets. April Price chatted while pouring a delightful King Frosch Riesling, then a Stonewood Chardonnay, Leona Valley Cab, the count-on-it smooth Silkwood “Red Duet” with its blend of 50% Cab and 50% Shiraz and finally a Craneford Allyson Parsons Shiraz that April knew I would love. Salt Creek Grille’s Greg Amsler was on hand to help serve a Coppola Chardonnay, Pepi Pinot Grigio and a Sterling Cab. The Pepi Pinot Grigio, new for me, was delightfully refreshing. The Sunday Brunch crowd didn’t take notice of the new crowd of wine drinkers eavesdropping on their live band, and live WAVE radio coverage, that promised to go as long as the event. Sisley Italian Kitchen served up their private label, Maddalena Vineyard, of Chardonnay, Merlot and Cabernet. South Pointe Grill served their house wine, the Argentinean Trapiche, a Chardonnay, Malbec (Malbec is a good South American wine varietal) and Cabernet. Vines also served their Michael Mondavi developed wine, exclusive to the Hyatt, the Canvas bottling of Chardonnay, Merlot and Cabernet. Valencia Wine Company, always doing it right, didn’t stick to the plan of offering 3 tastes. Guy Lelarge, on his normal Sunday off, shone in what sippers Pam and Rich Jaffke thought was an intentionally matched sapphire blue silk shirt and watch…it must have been the wine. We were offered no less than 10 pours of everything Tobin James Cellars had to offer: Merlot, Cab, Syrah, James Gang Zinfandel, Liquid Love alongside Handley’s Gewurztraminer, Pinot Gris, Pinot Noir, Chardonnay and Riesling. Wine 101 reader Kathy Crone said she met winemaker Toby James when she was pregnant. He told her that she would have stayed pregnant forever if she drank Liquid Love. So that’s what she did today, with all of us, pregnant with wine. At 4:30 the raffle held at Ro, Ma got started. Guy bought one ticket and headed over to check it out with everyone else. He was surprised to win a trip for 4 to a winery, and in front of everyone, Guy realized that he didn’t need to win and gave it back. Caves, Barrels and Clay Pots – Then Onto Sonoma! That said I thought more people may have visited the Historic caves, I know I had seen some press on it, than the newer Estate caves. I wanted to see for myself why a cave tasting would be the best way to spend a day in Napa. Having had barrel tastings in the past I thought I was prepared. Not a chance. My husband Eddie and I were greeted by Del Dotto’s conversant winemaker Gerard Zanzonico. While I was reluctant to leave the ornate tasting room, I was drawn into the caves by the flicker of the Venetian glass chandeliers and marble floors. At this point in the tasting I was writing blindly on my note pad, saturated with semicircular red wine stains. Zanzonico used a large glass wine thief (I told you in a previous column that this is like a turkey baster) to draw out the wine from the barrel and into our glasses. I tried my hand at it, fearing I would break the thin glass vessel, so once was enough. I poured out so much wine I felt guilty, while Eddie kept the pace with Zanzonico, I had a column to write and had to maintain some objectivity. We worked our way to the back of the caves and behind an ornate black rot iron gate to where the clay pots were stored. I was getting excited about trying something I hadn’t never tried as well as being drawn into my surroundings. In another time it would have been a monk tasting the wines; not a blond from Santa Clarita. You really had to just hold your nose above the glass to smell the aroma, first taste: clay. Zanzonico encouraged us to swirl and try again: less clay. Third swirl: the beginning of an interesting wine. I marked my favorites and fantasized about having a barrel, or clay pot, of my own one day. But only if Zanzonico is there. It has been awhile since I attempted to taste more than the 54 wines Zanzonico poured the day before, but Eddie and I once again faced the challenge for Signal readers. Sonoma Wine Country Weekend, held this past Labor Day, was anchored by a plethora of wine and food. Tented tasting areas were devoted to different Sonoma valleys: Alexander, Dry Creek, Russian and Sonoma. Readers, that sent suggestions to me, I was more than happy to oblige and limited myself to: Amphora’s 06 Pinot, Carica’s 06 Syrah, Chalk Hill’s 03 Cab, Chateau St. Jean’s 04 Cab, Cline’s Syrah, Gerrari-Carano’s 05 Cab, Landmark’s 05 Steel Plow Syrah, Ledson’s Merlot, MacMurray Ranch’s Russian River Pinot, Matanzas Creek’s 04 Merlot, Papapietro Perry’s 06 Pinot, Seghesio’s 06 Zin, St. Francis’s 04 Cab/Syrah blend and Trentadue’s 06 Sangiovese. I really wanted to take the Reidel “Sensory Evaluation” class but we missed it. We wanted to do the MacMurray Ranch tour and learn how actor Fred MacMurray made the ranch his home; too late. And of course I wanted to eat and drink everything too; simply impossible. Looking back I recall two different gazpachos: one with watermelon and the other cucumber. And my favorite appetizer of the day had to be from local restaurant, “the girl & the fig”: warm fig and walnut crisp. But, during the heat of the day, somewhere between the tents for Alexander and Russian we simply just had to sit and recharge. We watched a few minutes of the Steel Chef Competitions before settling in for a hands-on lecture in the “Crush Pad”. Members from the Sonoma Valley Vintners board showed us the de-steming and crushing process for the first phase of winemaking. Remarkable to us was how grape juice alone, without added yeast, became denser and more interesting in the process. The “Bubble Lounge” that we noticed at the entrance we visited on our exit. I had dumped my Sangria snow cone into my glass, nibbled on a few elegantly crafted hor d’ourves and crash landed onto a waiting couch. It was downtime. The stats: Over 4000 attendees attended the weekend events, which grossed a total of 1,570,705 to benefit charities. More than 120 wineries and 60 chefs offered their wines and foods for sampling in the 29th year of this event. Seminars, freshly harvested grape tastings, hands-on winemaking, and a top chef competition gave visitors a sampling of the diversity and quality of Sonoma County. The success of Sonoma Wine Country Weekend 2008 is far reaching and will be anticipated as a highlight again in 2009. It’s been exactly 24 hours since I was transformed, since I had a VIP pass around my neck and I still feel every second my hand is no longer clinging to the huge wine goblet emblazoned with four simple words: Loose Goose Wine Festival. Southern California’s largest wine festival is right here in Santa Clarita. Now in it’s forth incarnation, the festival has increased exponentially in size with each year. The number of guests, wineries, restaurants, vendors and entertainment only continues to serve as the premier wine event for the Santa Clarita Valley. No other wine event in Santa Clarita runs for as many days or boasts as many visitors from inside and outside of our town, 30 minutes north of Los Angeles, as our Goose. The Loose Goose Wine Festival benefits Henry Mayo Newhall Memorial Health Foundation and the Brenda Mehling Cancer Fund. The former raises funds for the capital needs of our only full service hospital while the latter supports patients undergoing cancer treatment. An Asti Monferrato, Brachetto Piemonte, that was poured for VIPs upon entry (from the Grape Crusader) may soon be purchased at the Loose Goose Cellar at the special price of $18 for members. A wonderful refreshment; something sparkling in our glasses set the stage for joining not only the fest but teased us into the rewards of exclusive membership. Membership to the Loose Goose Wine Society is open to all. No obligatory wine purchases but instead Members receive special privileges at partner wineries, restaurants, wine events and exclusive access to the Society’s private cellar and tasting rooms in Old Town Newhall. You can get two Member tickets to next year’s festival for an upgraded experience package for $154. Join soon as the next opportunity to enjoy a truly special wine experience is at Union Station, reserved for members only: November 23. After Sunset in the Vineyard, hosted by Jeannie Carpenter for the Assistance League, I kept in touch with a few of our local winemakers. One, Roman Weiser, aka “Wine Bordeaux”, suggested an idea for my readers. Wade through our wine soaked journey below and send me your thoughts. 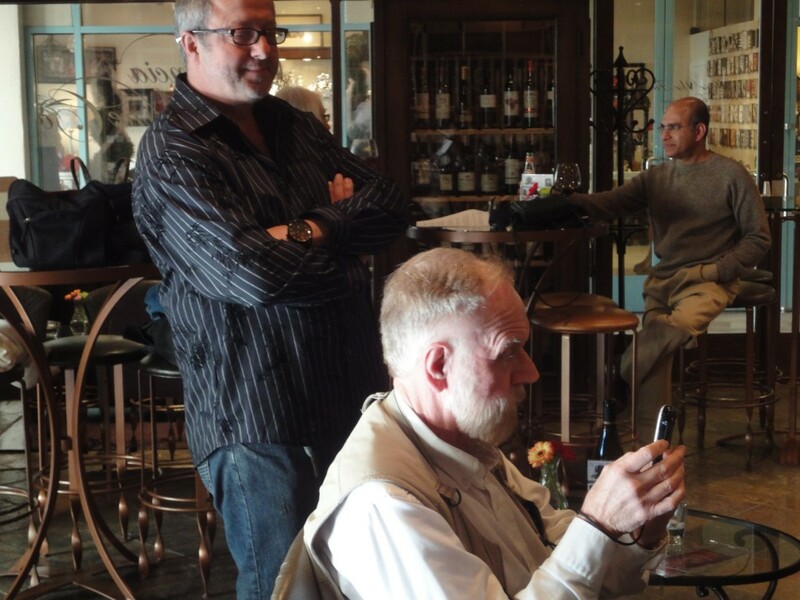 Director Roman Weiser (a winemaker of many talents) and videographer John Dickey, hard at work! At this time of a year the newly made wine is already resting in barrels, but there is plenty of other fun stuff to do. For example the ‘chores’ like tasting barrel samples or racking (separating wine from the lees sediment). This is also the time to think about the name for our wines and design the label. Every wine has a story behind it and the label usually reflects just that. It’s like finding the right name for a newborn; home wine makers are funny that way. Vineyards are getting ready for dormant stage. The leaves will soon fall and vine growers sharpen their pruners as this will be time to give our beloved vines a healthy ‘haircut’. And then we wait while continue racking the wines and taste them carefully to see if the oak is at bay and the wine continues healthy upbringing. Eve, we are planning many new things and we will inform you about them as they crystallize. Wow Roman, lots of food for thought here. I would be interested in any phase of the wine making process and hearing more of what you have to say! My column runs every week, lots of events to cover…am also interested in non-event news. So, what was your idea? I think you don’t have any Alsatian wines… Am I right? Alsace is located in North East of France, between the Vosges and the Rhine river. All wines planted are white. The grapes in Alsace are: Riesling (23% of Alsace wines), Pinot Blanc (20%), Gewurztraminer (18%), Tokay Pinot Gris (13%), Sylvaner (12%). The best producers: Albert Mann, Zind Humbrecht, Barmes-Buecher among others. I love Albert Mann’s Riesling and Gewürztraminer. They are semisweet and oh so seductive! OK, you are on – what wines do you think you have that I don’t? No, I don’t have any Alsace in my cellar, I think, at the moment. But I’ve had them! Does that count? I bet you don’t have the inaugural year of Agua Dulce’s (AD) champagne! I have a list…wait…ok so my husband has it hidden from me…don’t know why…but I know for a fact I have an 1986 Lynch Bages (LB)…the rest I’d have to look up. Gee talking to you is like talking to COC’s Wine Classic wine chair Jeff Jacobson. Very well! See, this was fun for us two – it surely will be fun for your readers. I am sure the idea can be taken bit further, to bring a little of competition into it! LB 1986 scored well on Parker – 92 pts and it can be a good bottle to open now, and next 10 years. I have large collection of Bordeaux wines, they are my passion. Oh yes I do know Jeff Jacobson. We are friends. I always assist him pouring wines at the Wine Classic. We’ve been buying Bordeaux futures since 2000. But we can’t open the LB as it’s the year we were married (yes, that’s how I remembered it). So I’m guessing that we better drink it by our 30th – thanks for the advice! Yes, I know AD’s is a Sparkling, damn! Good luck and let me know if you need my assistance in the future. Sending a thank you to my wine guru, Guy Lelarge of Valencia Wine Company, isn’t always in order for me as, well, I figure I will be thanking him in 1000 words or less afterwards. I can’t tell you how much I appreciate the Signal for getting my foot in the door at the classiest wine events in Santa Clarita and beyond. So, for those of you that are living precariously through my foot, here goes. Greeted on the patio by the always, how-do-they-do-it attractive staff of Tournament Player’s Club (TPC) Valencia, we were given not a one or even a two ounce pour of Mitch Cosentino’s crisp 2007 Novelist. Everyone would be enjoying at least a four-ounce pour of all 5 wines that evening, when two ounce pours are the norm, that were especially paired by LeLarge and Chef Daniel Otto. And, not to be outdone, Chef Otto had paired plenty of appetizers, not even on our menu, to enjoy with the wine while watching the last golfers find their paths home. “I try the wine and then decide how to pair, it’s like a marriage.” Otto said. “The appetizers complemented the wine perfectly,” said Larry Mazzeo and Jennifer Haberer. “They really had a great variety”. That variety included no less than caviar, Ahi tuna, lobster and duck canapés as well as skewers of coconut shrimp with sweet Thai chili sauce and filet mignon. “Mitch is a master of golf and winemaking,” Commented guest Graham Higton. “He had spent the day here golfing without a single complaint in the 100 degree heat.” Fortunately for us the heat had been replaced with cool breezes and waning sunlight. Dave and Nancy Bossert told me of their September event to support SCV art. “We are pulling out all of the punches for some star power,” Bossert began. “George Scribner has created a piece titled ‘Better use a sand wedge’ just for guests purchasing tables at the event”. Kenny McMann and Jeanie King seemed to be sporting tall iced glasses in one hand and wine glasses in the other. Before I could presume they were two-fisted drinking with other libations, Kenny raised his glass above his shoulders to prove the clearness of the water he preferred to keep handy. Dan and Heather Deffenbaugh, the latter looking tanned and crisp in a beautiful satiny halter while the former preferred to wear his designer shades on top of his full crest of glossy hair, were gracious in holding a tray of appetizers for me. We were then ushered into the main dining room for our first course before I could cause any more trouble. “I want to introduce you all to a great man, my old friend and great speaker Mitch Cosentino.” Lelarge announced to the full room. Tequila smoked salmon was colorfully accompanied by mesclun greens, hothouse cucumber, juicy wild fig and berries. Paired with a Cosentino Chardonnay Sculptor 2006, no one could find traditional California over-oaked flavors in. That was quickly followed by a Chilean sea bass over hummus and spinach paired with Cosentino Pinot Noir Sonoma 2006. The first red of the evening brought out the subtleness of both the fish and the hummus. Our main dish, Australian rack of lamb went with Cosentino Napa Cabernet Sauvignon 2004. An awesome pairing; as the chef’s choice of an Australian lamb brought out the cab flavors. On a recent trip to Napa, and staying at the guesthouse of winery owner Suzanne Phifer Pavitt (http://www.phiferpavittwine.com/) along the Silverado Trail, I wondered how a small 300 case producing winery that stays away from retailers, restaurants and tasting rooms markets their 95 point scored wine. Through the web. Suzanne enraptured me with stories from the winemaking business in Napa that night and extended an invitation for me to stay at her guesthouse, anytime. That time was last weekend. And I got a few more questions about how a business markets itself on the Internet answered. One of the websites Phifer Pavitt wines has been highlighted on is geared for women wine drinkers while other sites are more general. And of course, there are some print articles, but the Internet articles outweigh them. Suzanne’s home office is centered by her computer. So now it brings me back to the web and this article you prefer to read from a backlight square inches from your face. There are new ways to market your business and being a hybrid is necessary to compete. It’s not the future; it’s now, are you going to let every other business owner, be it centered on wine or not, grab it? I really enjoyed the by line of your article under “Woman, Wine helps out Life through Art” and the fact you are from Santa Clarita, were invited to the Life Through Art Foundation, as well as meeting many people at this event. I live in Santa Clarita and I am an artist. Actually I am a retired art teacher from Madison, Wisconsin. I was very impressed with the information about how this group has brought ART to 10,000 children in different kinds of art experiences. During my art education professional life I taught over 12,000 children during 26 years of teaching elementary art and middle school art. I also taught college students at the University of Wisconsin who were required to take art to get their degrees and be elementary classroom teachers. I moved to Santa Clarita in 2003 and joined the Santa Clarita Artist Association and became a board member, then the chair of the annual ART CLASSIC in 2006. This event is the exhibit of the member’s art and the yearly fundraiser. The public is invited to attend and see around 120 pieces of original visual art.This year the Art Classic will be held on Sunday, November 9th at Hart Hall in Newhall from 2:00 pm to 6:00 pm. Wine is part of the Art Classic event. We have had different wineries in the past few years. We would like you to attend and tell your readers about this worthwhile cause. There is a great absence of visual art in Santa Clarita and a small group of people in our city are working to promote the great need to offer art events for the community to attend as they do for sports. The Santa Clarita Artists’ Association [non-profit 501(c)(3)] was founded in 1989 by a group of local artists who had a desire to share their expertise, knowledge, and enthusiasm for art. The Association has a broad range of talent from professional to novice. Members provide the ability to encourage, assist, develop, and exchange ideas and information in building on artistic skills. Their mission is to promote art in the Santa Clarita Valley by “Making Art Visible” They provide scholarships to graduating seniors in the William S. Hart High School district, and assist members with furthering the marketing and business aspects of their artwork. They provide exhibit opportunities, marketing concepts, advertising and exposure by developing an atmosphere of friendship, mutual cooperation, recognition, and appreciation for artists. Glad to have read your article and learn who you are. Tournament Players Club (TPC) located at 26550 Heritage View Lane in Westridge. Champagne reception at 6:30 PM; 5 course gourmet Dinner at 7:00 followed by the Art and Wine Auction. Honorary Chair: Roy E. DisneyEvent Chairs: Guy LaLarge, Dave Bossert, Don Fleming, Cheri Fleming, Ken McMahan, and Greg McWilliamsEvent Director: Jeff ShapiroEvent Coordinator: Lesley SolmonsonAuction: Sotheby’s, Inc. The Santa Clarita Valley has always been an artistic hub—from the early days of the film industry, through the establishment of Disney’s Golden Oaks Ranch facility, the founding of the California Institute of the Arts (CalArts), to the planned UCLA Film Archives. The residents have been equally supportive of the arts, supporting a ballet company, a symphony, numerous artists associations, the annual Cowboy Poetry and Music Festival, and the College of the Canyons Performing Arts Center. Between CalArts faculty, alumni and students, coupled with those residents in the entertainment industry and other independent artists, the Santa Clarita Valley boasts the highest concentration of artists per capita in the world. The TPC/West Ranch Art and Wine Auction will be the premier event supporting the arts in the Santa Clarita Valley. Boasting some of the finest wines around and contributions from leading artists, many of whom have their roots in the Santa Clarita Valley, the event will offer attendees the opportunity to bid on many one of a kind wine and art items. These include original paintings, drawings and sculptures from established Disney and fine artists. Attendees will also enjoy fabulous food and wine from the award-winning chef of the Tournament Players Club. In our inaugural year, all proceeds will go to benefit the Joe Ranft/Alumni Scholarship Fund at California Institute of the Arts. For future events we plan to expand the beneficiaries to include other arts organizations in SCV. • $5000 Sponsor table- Each PERSON receives a signed and numbered artist print, a premium bottle of wine, the table sponsor is listed in the program/catalogue; a special photo opportunity; as well as receiving a full page ad. (AD must be provided as a JPEG). I had signed up for e-mail notifications from Women & Wine and had been enjoying the stories on their website and listening to some of their radio interviews. I also received e-mail news from their store, Wine Valet, as I was intrigued with their location: the P-1 level of a valet parking garage at Rodeo Drive and Wilshire Boulevard. Getting off the Hollywood freeway, and driving down the famed Hollywood Boulevard took me back to my youth. It had been decades since I danced on the stage of Gazarri’s and almost as long since I gave up Meyers Rum and OJ. Enter the world of wine and sophistication as old Hollywood moved over from hot spots to Julie’s resplendent home in the Hollywood Hills. Brooks guided me to a table laden with fliers of past events. One name I recognized on a glossy announcement from their 4th Annual Red Party Honorees was former Signal columnist, Jack Burditt. Is Jack back from New York and ready to put some comedy back on our local Signal pages again? Turned loose on the party just beginning, I found an empty table I could rest my notes and newly filled wine glass on. Two gentlemen passed through the group with trays of appetizers from Freshdining.com. I was tickled again to find that these same delights could be delivered to Santa Clarita as well. While nibbling on goat cheese stuffed zucchini with a Kalamata olive reduction sauce I spied another woman alone and asked her to join me. Her name was Corinne Bordeaux, yes I couldn’t believe it either, and she was there to promote the film Bottle Shock. This much anticipated film in the wine world is based on the famous 1976 “Judgment of Paris” that pitted California winemakers against the French – and we won every category. “The film garnered rave reviews from both the Hollywood Reporter and Variety,” Bordeaux began. “That is very rare. It was also well reviewed by Sundance and Wine Spectator. It is being touted as the ‘Rocky’ for wine aficionados”. Next I met a slender young “boy from Alabama” that looked quite officious. Nat Gunter was fighting LA’s rep as a “Vodka Town” as the wine buyer for Chateau Marmont. He walked me back over to the wine tasting and coaxed me into trying a 2005 Phifer Pavitt Napa Valley Cabernet Sauvignon aka “Date Night”. It was as charming as he was. The next two people to slide over to our friendly group were Gary Warburton and his daughter in-law Suzanne Phifer Pavitt. Suzanne was a beautiful blond from Georgia that had married a Manhattan Beach native and moved him to Napa. Looking at my watch, and thinking of my drive, I refused to drink or talk more until I found my hostess. I found her husband, Marc Schector first. He led me on an impromptu tour of their richly decorated home and upstairs to the kitchen where I found CEO Julie B. “The chef doesn’t really need any help,” Julie said. “I just wanted to whip up a little salmon so that we don’t run out of food.” She gave me both a warm hug and a handshake as I told her that her guests seemed to appreciate having some press at the event and thanked her for the opportunity. As I then stepped back and watched her oversee everything, from websites to wine stores and art foundations to salmon, all I could utter was that we would have do this again. As there is nothing better than women, wine and the optional man.